The genus Pseudotropheus belong to the family Cichlidae. All Pseudotropheus species come from the same lake, Lake Malawi in eastern Africa. Since they hail from the same lake they have similar requirements when it comes to spawning, but Pseudotropheus is a diverse genus and you should always check if there are any special requirements for your particular Pseudotropheus species before you try to breed them. The Pseudotropheus cichlids inhabit a lot of different environments in Lake Malawi and their needs can vary considerably. If you are a beginner, the Pseudotropheus demasoni is a good choice since it is one of the easier Pseudotropheus species to breed in captivity. Make sure that the environment is ideal for your Pseudotropheus cichlids, and monitor the pH-levels, amounts of soluble waste, water hardiness etcetera vigilantly. You should also feed your Pseudotropheus cichlids a nutritious diet and make sure that they are healthy and without parasites. A large water change will often trigger spawning in Pseudotropheus demasoni, just as for many other Pseudotropheus species. You need to provide your Pseudotropheus demasoni with suitable breeding sites, such as 2 or 3 flat rocks. The spawning behaviour will start with the male Pseudotropheus demasoni chasing the female. He can be very violent, so it is advisable to kept one male with several females since the stress experienced by each female will be lower this way. Pseudotropheus demasoni are female mouth brooders, which means that the mother will pick up the eggs and guard them in her mouth. The female Pseudotropheus demasoni is usually a very good holder and it is uncommon for Pseudotropheus demasoni mothers to spit out their offspring prematurely. Always try to keep the female in a stress free environment, since severe stress is one of the things that can cause even a Pseudotropheus demasoni to spit her fry too soon. Another Pseudotropheus species that frequently spawns in aquariums is the Pseudotropheus saulosi. A male Pseudotropheus saulosi will arrange a suitable spawning site. He prefers a sandy bottom which should be considered when you set up your Pseudotropheus saulosi aquarium. A place where at least one side of the spawning site will be sheltered by a large rock is popular. Some male Pseudotropheus saulosi will dig a crater that reaches all the way down to the glass bottom of the aquarium. When the male is finished with the spawning site, and the female is ready to deposit her eggs, the male will start to shake his body in front of her to attract her attention. If you keep several male Pseudotropheus saulosi, the most dominant male will shake in front of all the less dominant males as well. A subordinate male can choose between fighting for dominance, or clamp his fins and loose his colours as a sign of submission. Keeping several male Pseudotropheus saulosi together is however not recommended, since fights for dominance can go on until the weakest fish is dead. When the male Pseudotropheus saulosi have spent some time showing off in front of the female, he will lead her to his selected spawning site. You can notice how he swims away from the female, towards the spawning site, while waggling his tail vigorously. When the spawning has taken place at the spawning site, the female Pseudotropheus saulosi will pick up the eggs and guard them in her mouth. A Pseudotropheus saulosi batch typically includes between 10 and 15 fry. The eggs will hatch in her mouth, and the fry will stay there until they are free swimming. The fry will be large enough to spit out two or three weeks after the hatching. The female Pseudotropheus saulosi will eat while brooding, and it is very likely that the small fry eat some of the food inside her mouth. A third Pseudotropheus species sometimes bred in captivity is Pseudotropheus crabro. It is a very beautiful, but also very large Pseudotropheus cichlid. The fish will need at least a 50 gallon aquarium, preferably 100 gallons or more. They are not very easy to breed in aquariums. The easiest way of obtaining a breeding couple is to buy six or more juvenile Pseudotropheus crabro and let them grow up together. This way they can form their own pairs. It is imperative to provide your Pseudotropheus crabro with a set up a similar as possible to the natural environment for this fish. Pseudotropheus crabro inhabit large caves in Lake Malawi, situated at a depth of 10 to 40 meters. The pH is between 8.5 and 9.2 and the dH between 8.0 and 14.0. A larger water change will often induce spawning for Pseudotropheus crabro cichlids. They must also be given a suitable spawning site, such as a flat rock. 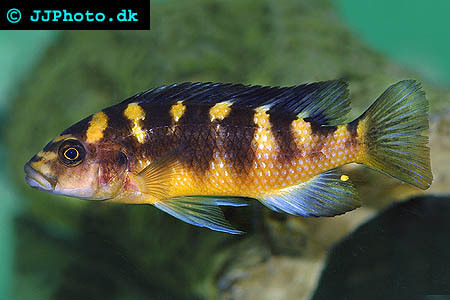 During the breeding period the male Pseudotropheus crabro will change his outlook into a darker, almost black, colour. He tries to catch the attention of the female Pseudotropheus crabro by encircling her and shaking his body forcefully in front of her. During the next stage of courtship the male tries to lead the female to the spawning site. Since Pseudotropheus crabro is a female mouth brooder, the female will pick up the eggs from the spawning site and guard them inside her mouth. In ideal conditions, the brooding lasts for 18 to 21 days before the fry are released. Free swimming Pseudotropheus crabro fry can be fed Cyclops or similar food. One of the reasons behind the rareness of successful breeding of Pseudotropheus crabro in aquariums is the temperament of the male Pseudotropheus crabro. He will chase the females around a lot and harass them violently. The stress experienced by the females during the courtship period and while they are brooding will often make them eat the eggs, or the spit them out instead of guarding them. A good idea is to build a large cave in the aquarium. The male Pseudotropheus crabro is much found of caves and will quickly claim the cave as his own. He will then stay in or near the cave to protect it from intruders, and the females can feel safe in the rest of the aquarium. It is also imperative to provide the females with a lot of rocky hiding places and other sheltered areas in the aquarium where they can feel at ease.